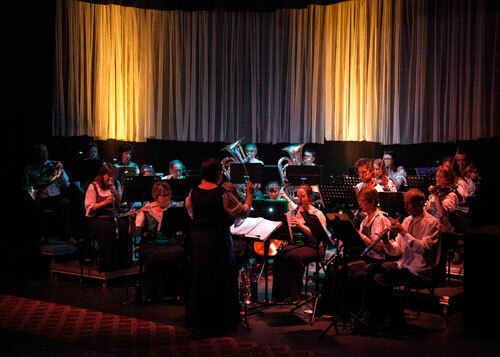 A community orchestra that celebrated its 10th anniversary in 2017, the MAD Orchestra is a concert band that comprises brass, woodwind, strings and percussion players. In addition to supporting various events around town (Australia Day, ANZAC Day, Spring Festival, Carols, etc) the band also contributes live music to Mansfield Music and Drama Society (MMuDs) musicals as needed. The Orchestra also hosts its own concert each year to demonstrate the range of skills and talent we have within our community. We play a variety of music styles and cater for a range of abilities and players of any age. All musicians who are keen to play music with others are welcome. The MAD Orchestra practise sessions are held every Monday from 7:00 – 9:00pm at the Buckland Centre, Erril Street, Mansfield. ​MAD Orchestra and Strings in the Riverside Marquee performing a bracket of popular pieces at the Jamieson Autumn Festival 2018. MAD Orchestra providing musical support during 2017 'Relay for Life' event at Mansfield Showgrounds. MAD Orchestra performing in the median strip during the High Country Festival Grand Parade. Sunday morning at at the March 2018 Mansfield Farmers Market providing light entertainment.